Health and Physical Education is an important component in the curriculum at Opaheke School. 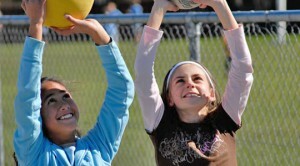 Regular physical activity is implemented in a wide range of contexts to assist their personal and physical development. The programme is planned to provide learning experiences in mainstream sports, such as Athletics, Swimming, Rugby, Soccer, Hockey, Touch, Softball, Cricket, Cross Country Running and Gymnastics, to name a few. There are also many valuable learning experiences to be gained from the less traditional sports that are offered during class sports sessions and during the lunchtime, such as Indoor Hockey, Tapuae, Table tennis, Gutterboard competitions, Water Polo, Paddertennis, and Modified Games, to once again name a few examples. One of the major underpinning attitudes of the physical education programme that is regularly reinforced with the children is that they should, and can, all be actively involved in some form of regular physical activity. To encourage this attitude, outside agencies are asked to come to school to promote their sport. In the past we have had athletes from such sports as roller hockey, squash, wrestling, rock climbing, Kung Fu and badminton come into the school to provide demonstrations for the students. Opaheke School encourages the children to search out community links for sports that they find appealing and motivate themselves to become physically active. At the Year 7 and 8 level Opaheke School joins other local full primary schools such as St Mary’s, Papakura Normal School, Karaka, Conifer Grove, Te Hihi and Redhill to select a specific sports team called North Counties. This team competes against full Intermediate schools in the Counties Zone competition. Should any of the students be winners at the Counties Zone level there are opportunities for them to compete in the Auckland Districts Championship events. At this level, the teachers in the senior school encourage the students to trial for a wide variety of sporting options. The goal is for teachers to present opportunities to the students that may lead them into community sports groups.